A somewhat small place to warrant an entry here, this medieval village nevertheless is a good example of the region's small-scale gems that are always worth a detour, preferably around lunchtime for some cucina tipica in one the excellent local restaurants. Turn off in the modern village on the main road to climb up to the old centro storico. The first thing you'll notice as the village comes into view are the copertelle, or covered walkways built above the 12th century walls. You can stroll through them taking in the splendid views of the valley below. Then search out the church of Santa Lucia, one of the region's prettiest high baroque churches built in 1650 on an older church. In amongst the gilt and the cherubs are remarkably fine paintings by Guido Reni, Pasqualino Rossi, and the Cavaliere D'Arpino. 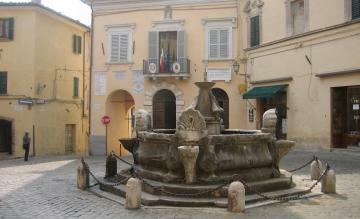 When you've finished take a coffee in the small opera-set piazza with a pretty fountain and a flag-draped town hall (photo above). Another good reason to visit here is to try the town's calcioni pastries with their curious sweet and sour cheese and lemon filling.